Artwork for the III International Contest of Scientific Illustration of Dinosaurs. I like how you colored the whole picture. Beautiful image! As much as I love the dino's I'm fascinated by the water! The perspective and the reflection as well as color is excellent! Well done! Look at the smile on Demanda's face! He says: "oh it's just a crocodile. You're not going to be a threat to me, you're not big enough!" I like the way they're dwarfing Deinosuchus! BTW, congrats for winning the prize, you're worth of it! Dat croc is no Deinosuchus....... More likely a Goniopholis-like crocodile. Is that really Deinosuchus? 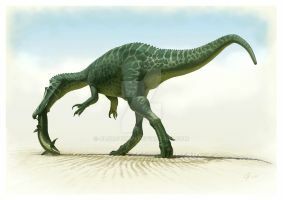 If so, Demandasaurus is surely a contestant for biggest dinosaur! I wonder what made them decide to name the species that? Probably because it 'demanded' so much space and food, eh? Seriously though, this is awesome! It's a goal of mine to someday be able to paint these beasts just as majestically as this. love it!! the composition is truly awesome! 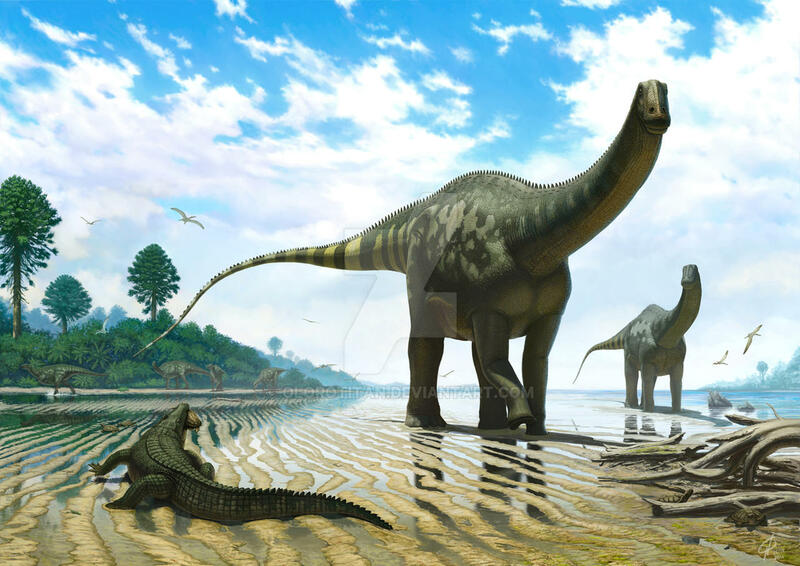 2 questions: what are the hadrosaurs and the crocodylomorph called? wow what a nice piece. Love the water stripes in the sand with the reflections. Fantastic picture, You can feel the atmosphere and depth, great work! Amazing, but seeing those saurpods (forgets her dinosaur spelling) walk along this beach makes me wonder if their feet were like the camel's. like the camel's? In what sense? Camels have specialised feet so when they're walking on sand and other surfaces like that they don't sink. 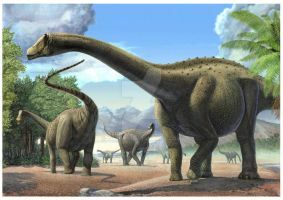 hind limbs Sauropods were with very wide pads, we can see it on their many tracks. The area is less on forelegs. The textured mudflat (with reflections)makes it...Nice touch. "Alright, what are your demands?" Hearty congratulations for sweeping the floor at IPIC 2011 with this! Great job on the foreshortening. Very physically believable. this is amazing but just so u know there is a problem. in the sand/mud the tracks of the gater dont seem deep inuff let alone theres no drag marks. 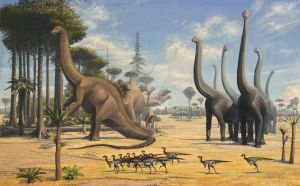 similerly the Aptiosaurs feet art sunck into the mud and the rased foot isent driping. out side of that this is perfect. i can only hope to get to this leval. By the way, which are the crocodile and turtle species in the picture? 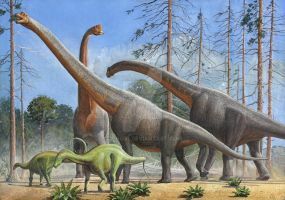 is it just me or is the ornithopod furthest to the left missin its arms? Its arms are along its body, also low resolution of the image hides many details and the arms are not visible clearly.